Nations Press health 3 IMPORTANT TIPS TO SURVIVE DURING HEART ATTACK WHEN YOU'RE ALONE! 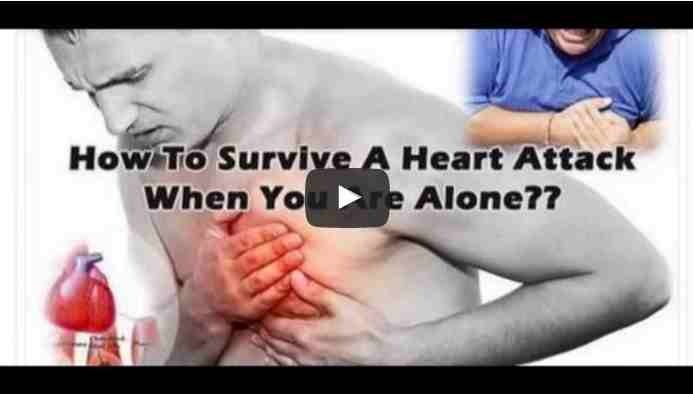 3 IMPORTANT TIPS TO SURVIVE DURING HEART ATTACK WHEN YOU'RE ALONE! SPONSORED LINKS Although considered as one of the leading causes of death in the world, it may indeed be possible to survive or even prevent a heart attack if you keep certain things in mind. Avoid things that trigger a heart attack in the first place. To begin with, heart attack is often caused by smoking, high blood pressure, lack of physical activity, excessive fat, improper diet, or high cholesterol level. This just means that implementing lifestyle changes can help you have better health. Be aware of the symptoms. Next, you have to be familiar with heart attack symptoms some of which are dizziness, excessive sweating, fainting, heart palpitations, lightheadedness, rapid heartbeat, shortness of breath, or tightness in chest. In most cases, you may also feel pain or uneasiness in certain areas of your body such as your arms, chest, jaws, neck, teeth, or upper abdomen. Women, in particular, are prone to nausea. What to do during an impending heart attack. Ideally, you should always have your medications with you at all times. Take them according to your physician’s instructions. For some patients, chewing a 325mg aspirin can be advisable since it helps improve blood flow. Others, however, take nitrates during a looming heart attack. Consult with your doctor to know which medicine will be best for you. If you have a bottled oxygen with you, use it. In case there is a nearby hospital in your location, get in touch with them right away. Tell them the symptoms you’re feeling and follow any instructions they tell you. Let your family members, friends, or neighbors be aware of your condition. More importantly, keep their numbers on speed dial so you can easily contact them whenever necessary. If you are driving, pull over to avert disaster. This is crucial because medical experts say it only takes a few seconds to pass out. If you are on an airplane, tell the flight attendant if you feel an imminent attack. Most airline personnel are trained to administer first aid and CPR plus they often carry medications onboard. Most importantly, try to remain relaxed. Panicking can make your situation worse. Try to breathe slowly and keep calm as much as you can. If needed, lie down on a couch or the floor and raise your legs upward so you can breathe much easier.